were staged at a new purpose-built equestrian sports arena at Greenwich Park, London in July and August. The venue is the oldest Royal Park in London, dating back to 1433 and was made a World Heritage Site in 1997 and is also home to the Royal Observatory. 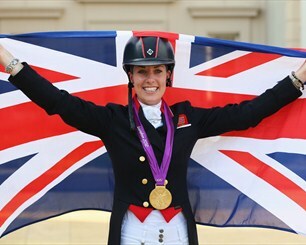 Charlotte Dujardin of Great Britain riding Valegro won Individual Dressage Gold with 90.089 per cent. Dutch rider Adelinde Cornelissen riding Parzival gained the silver medal and Laura Bechtolsheimer of Great Britain riding Mistral Hojris won bronze. The Team Eventing gold went to Germany with Great Britain winning silver and New Zealand the bronze. 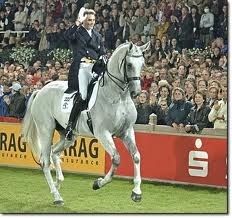 The Individual Eventing was won by Michael Jung of Germany with Sweden taking silver and Germany the bronze. The Team Dressage gold medal was won by Great Britain with Germany winning the silver and Netherlands the bronze. Information on the horse accessories required for optimum performance. Great Britain's showjumping team of Nick Skelton (Big Star), Peter Charles (Vindicat), Ben Maher (Tripple X III) and Scott Brash (Hello Sanctus)- Skelton secured the Gold Medal in heart-stopping style. Great Britain and the Netherlands could not be separated on points after two days of competition and the ensuing jump-off finally went the way of the British team when Peter Charles went clear on the last round. Saudi Arabia won the bronze. Germany clinch victory in the equestrian sports eventing competitionwith Great Britain claiming silver ahead of New Zealand who claimed the bronze medal. Zara Phillips lifted the GB eventing team into silver medal position going into the final day of the team eventing competition with 130.20 points. The German team lead with 124.70 points with Sweden in 3rd with 131.40 points. After the first day of the 2012 Olympics eventing dressage programme two Germans lead the way with Great Britain in 3rd place. Competitors from all over the world will come together to literally jump, skip and hop their way through an arduous journey of the 3 demanding routines - Dressage, Eventing and Show Jumping - that make up modern day Equestrian Sports. Every horse and rider pair perform a battery of movements and the best three scores from each team's four pairs are added together to give a score for each team. Every rider completes each section and penalty points are awarded. The best three scores from up to 5 pairs for each team are added together to give a final score for each team. The second and third rounds of show-jumping from the individual jumping event were used to determine scores for the team round. The best three scores from teams having more than three competing pairs were used to determine the team score. 1. Each rider performs a battery of movements and the 25 riders with the highest marks awarded by five judges go on to the next round. 2. The top 25 riders again perform the tests and the 15 riders with the highest marks awarded by the five judges go on to the final round. 3. This round consistes of a Freestyle Test choreographed by each rider and set to music. The judges scores are based on artisitic and technical merit and the final scores are based on the average results of the Freestyle and Tests of the previous round. 1. Dressage - Three judges give each rider a score out of 10 for 10 separate elements. The scores are then averaged and the result subtracted from 100 and multiplied by 1.5 to give a number of penalty points. 2. Cross Country - The rider must complete a 4.56km course of 29 obstacles in 8 minutes. Four penalty points are awarded for every second above that time and twenty penalty points for every obstacle not cleanly jumped. 3. 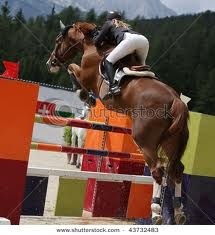 Show Jumping (1) - The rider must complete a course of obstacles. One penalty point is awarded for every second above the maximum time for the course and four penalty points for every obstacle not cleanly jumped or refused. 4. Show Jumping (2) - The top 25 riders after the first jumping section(limited to three pairs per nation) contest the second section of jumping; the scores from this are added to the scores of the first three phases to give a grand total. Round 5 the scores of this final round are added to the score of the previous round to give a grand total. Piggy French - winner of the Olympic Test Event 2011 and a member of the UK World Class Squad will ride DHI Topper W at the 2012 Olympic Games. Her other horse Jakata has suffered an injury and will ot take part. Reed Kessler, a 17 year old showjumper will be the youngest rider ever to contest an Olympics - she will have reached the the age limit of eighteen by the start of the Olympics.